It’s that time of year when we’re all on the look-out for fresh and healthy meals. 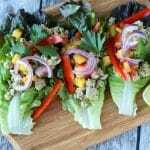 You’ll love these grain-free Turkey Tacos with Mango Salsa for a delicious, clean-eating lunch or dinner. 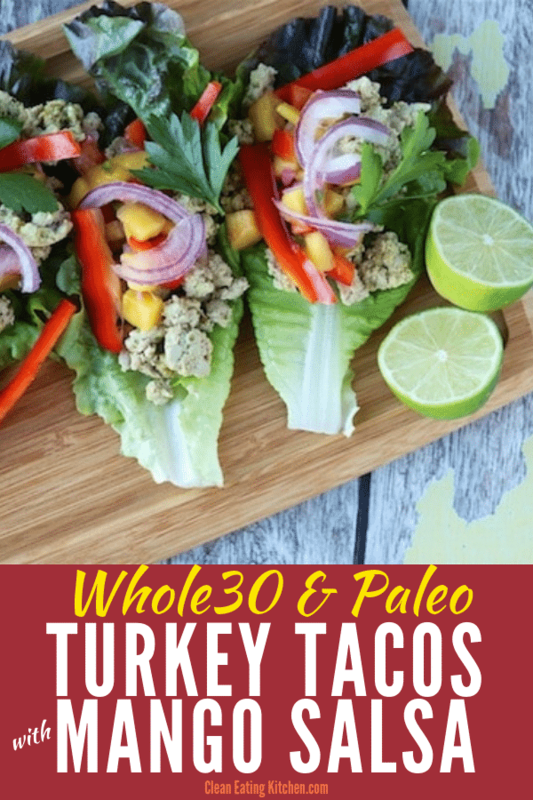 Is Turkey Paleo and Whole30? Yes, in fact turkey is an under-appreciated protein, given that it’s nutrient-dense and lower in fat than beef. Don’t get me wrong, I’m not a low-fat advocate, but sometimes it’s nice to have a lighter meal. Plus, you can always add healthy fat in the form of guacamole! I used ground turkey in these Turkey Tacos and specifically chose the pasture-raised turkey from US Wellness Meats (affiliate link included). I made a fresh Mango Salsa to add brightness to this dish. I also included an almond butter drizzle as an option for added depth of flavor. Plus, in the depths of winter, we could all use a little more brightness, amiright? Not that I’m complaining, friends, as I am currently on vacation in Maui, Hawaii. It is so beautiful and WARM here; I feel so, so grateful to be here. I’ve had quite a few fresh fruit salsas on this trip so far, and I plan to make some more when I get home to keep up with the tropical feel in my house. First, make the salsa and let it sit on the counter or in the fridge for at least 30 minutes so the flavors can combine. Next, cook the turkey and add the seasonings. When the turkey is completely cooked, remove the skillet from the heat and cover with a lid to keep warm. At this point, you’ll want to get the lettuce ready for serving. Chop off the base of the romaine and carefully pull off 8-10 of the outer leaves, being careful not to tear them. Wash them gently and pat them dry. When you’re ready to assemble the tacos, use a big serving spoon to fill the leaves with the cooked turkey, topping off each lettuce cup with some salsa. Serve the tacos alongside the almond butter as an optional topping. Serve immediately or place the tacos in a glass container to serve later! 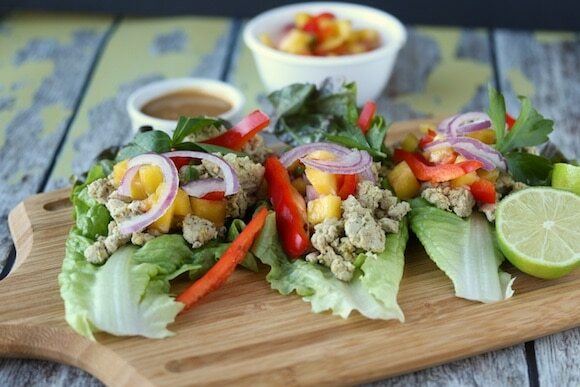 It’s that time of year when we’re all on the look-You’ll love these grain-free Turkey Tacos with Mango Salsa for a delicious, clean-eating lunch or dinner. First, make the salsa. Peel and cut the mango into bite-sized pieces. Place in a bowl with the minced red onion and red bell pepper. Pour in the lime juice and stir it all together. Let the salsa sit on the counter or in the fridge for at least 30 minutes so the flavors can combine. Next, heat a non-stick skillet over medium heat. Stir in the turkey and use a spatula to break it up so it cooks evenly. Add the cumin, dried oregano, salt, and pepper for seasoning. When the turkey is completely cooked, remove the skillet from the heat and cover with a lid to keep warm. For even more staying power, serve the tacos with sliced avocado or fresh guacamole. This is such a satisfying grain-free, Whole30, and paleo-friendly meal, I hope you like it too! Join my weekly newsletter list to get all the latest news delivered directly to your inbox. But that mango salsa! Gah! Super yum! Thank you for the great lunch idea! You’re so welcome, Renee! Happy New Year!!! My family loves lettuce wraps! 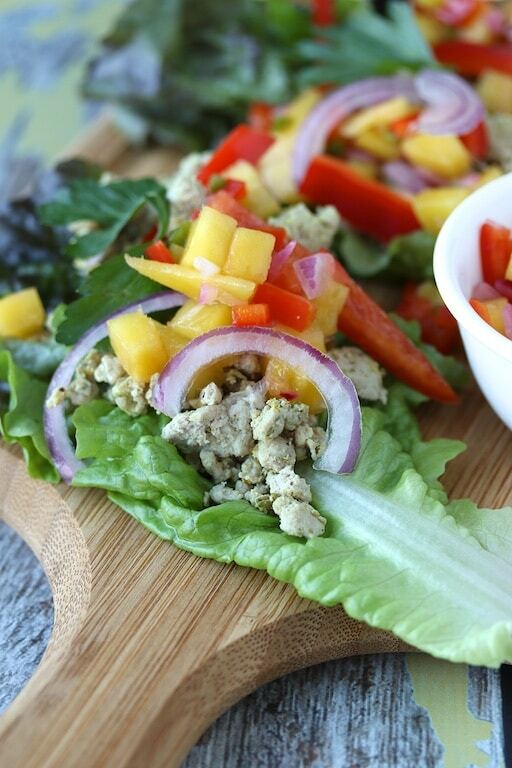 These sound delicious with mango salsa! I’m a huge fan of foods with fruit salsas, yum! Me too! Love to pair fruit salsas with meat. 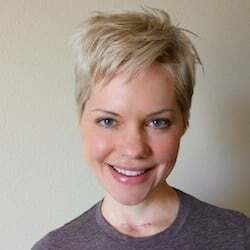 Take care, Emily! These sound great! Foster’s Farms is all they sell on base where I live, and the only organic options around. That red onion on top. Perfect! Thanks, Cristina! I’m so happy you can find organic options. Are you still in Hawaii? I just got back from Maui and the weather was SOOOOOOO amazing last week. I’m still in my Maui state of mind and can’t wait to plan another trip. XOXO. Oh I need that mango salsa in my life! It’s so easy too! Have a great week, Erin!!! You had me (and my kids) at mango. We can’t get enough of it! Think maybe it reminds us of warmer weather and tropical vacations. But these wraps look so healthy and refreshing. Will definitely be trying them soon! That’s exactly what I think when I eat mango too!!! Tropical fruits paired with meat dishes work soooooo nicely together. XO! Oh, mango! That sounds perfect! Great Whole30 inspiration for me right now. My family Is so all in for anything mango! Great recipe ???? That mango salsa looks so delicious and I’m sure is so good combined with the turkey! Looks like the perfect lunch! Thanks so much, Jessica! I hope your 2017 is getting off to a great start. XO. These are just so pretty, Carrie! Definitely adding them to my menu for the Whole30 I’m about to start. I’m thinking they’ll be great with almond butter, too! Thanks, Becky! I’ll be interested to follow along with your Whole30. Your recipes always inspire me!!! XOXO. 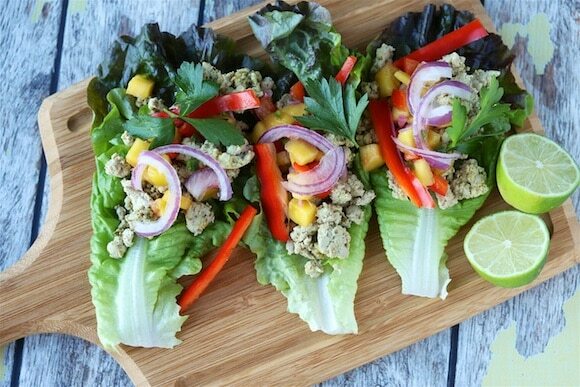 I’m loving lettuce wraps right now too! Thanks for sharing! You’re so welcome. Thanks, Holley!!! So many fun flavors and colors packed into one healthy dish! Love it! These look amazing, plus they’re so fresh which I’m really craving right now in the dead of winter! Thanks, Kari! I agree, it’s always nice to have some freshness during these cold, dark days. Turkey and mango together is superb!